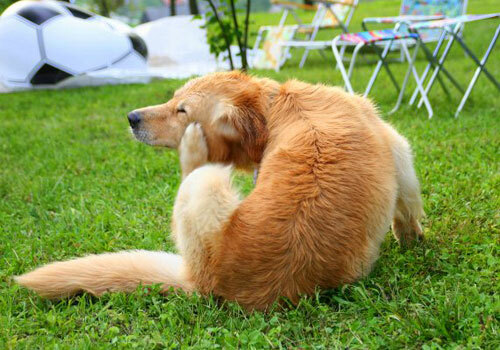 A very unfortunate reality for many pet owners is fleas. These nasty, irritating, insanely hard to get rid of pests can cause all sorts of nightmares, and searching for the best flea spray for your dog can be even harder. What particular characteristics should you be looking for in a flea spray? How does flea spray work? And which one actually fixes the problem? All these questions I have asked myself the multiple times that I have had to battle a flea infestation in my own home, and every time my veterinarian seems to give me a different answer. It destroys fleas at every part of the life cycle, and begins killing the pests as soon as you press the spray eject from the bottle! In this article, we look at what works best for fleas on dogs, how flea sprays work, what chemicals are used in them, some of the safety precautions of using flea spray, and suggestions of products you might want to try. Note: Above ratings are based on our experience with the product and/or expert opinions. Click the link above to read flea and tick reviews and see the current prices on Amazon. How Do The Flea Spray Work? 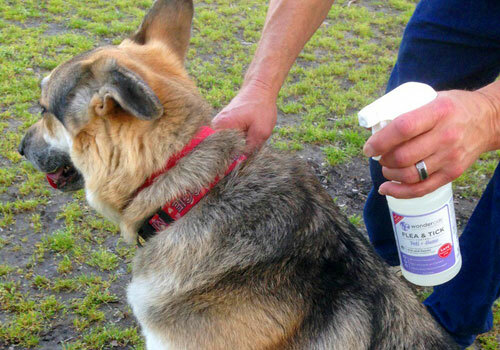 You’re spraying a medicated mist onto your dog’s fur because your veterinarian told you to. But what does it actually do? How does it work? And what exactly are the chemicals that are now flying around your home and sticking to your pet? Just like any other flea and tick medication, flea spray contains insect neurotoxins that intend to kill and destroy infestations on your dog. As a flea is a parasite that survives by piercing your dog’s skin and sucking its blood, the spray rests and is absorbed by your dog’s skin, poisoning the pests the next time they are feeling a bit peckish. Instead of killing the fleas when they first ingest the neurotoxins, however, flea sprays are designed to slowly attack the insect’s nervous system so that it can infect other fleas before it finally dies. Extra chemicals are also added to the concoction to target eggs and larvae. Known as ‘Juvenile Hormone Analogues‘ or ‘Insect Growth Regulators‘, these extra neurotoxins make it impossible for larvae to develop and reproduce, inevitably destroying future infestations. The active ingredients in flea sprays, however, may only account for a very small percentage of the overall substance. Classified as either “other ingredients“, “inactive ingredients“, or “inert ingredients“, companies are required by law to list these particular ingredients. What they are there for those is to serve a variety of functions, such as extending the products shelf life, helping the insecticide to stick your dog’s skin, as well as keeping the product at the manufacturer’s desired viscosity or solidity. These chemicals may seem scary because they are scientific and hard to pronounce, but due to the small amount of active ingredient actually present in flea sprays, although toxic to the pests, is considered safe for your dog. 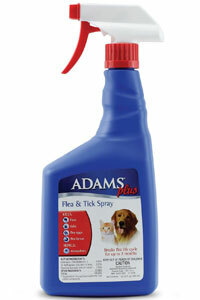 The benefits of flea sprays are that they can last for up to 60 days and can be used on pets of all ages and sizes. 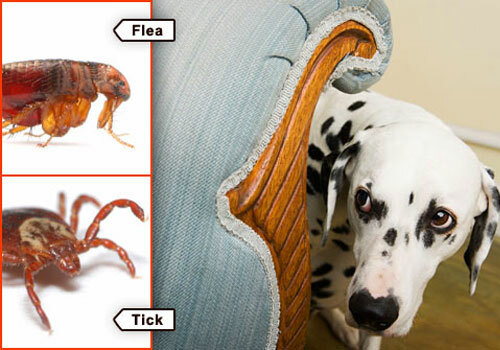 Another benefit of flea sprays is that the neurotoxin is applied directly to the affected area. Unlike flea collars that slowly distribute the chemical across your dog’s body or oral tablets that have to circulate throughout your dog’s blood stream, you can be in control of exactly where the flea spray is applied. You can also use the spray on your upholstered furniture, carpets, and rugs to kill and stray fleas. Most of the popular flea sprays also target the entire infestation, meaning adult fleas, their eggs, and the larvae. Other variations of flea and tick treatment don’t necessarily to this. On the flip side, the benefits of spraying the neurotoxins directly onto your dog can also be a reason many pet owners don’t use flea sprays as a form of treatment, and prefer oral tablets instead. Similar to when you spray cleaning agents in your home, the chemicals in the flea spray become airborne and can land on furniture or even be ingested by yourself or your pet. The chemicals used in flea sprays can be harmful to you or your dog, and particularly children, if ingested. As the chemical also sits on top of your dog’s skin and fur, children could touch the dog unaware of the treatment that is on them, and then put their hands in their mouth. However, when the flea spray does dry, it is perfectly safe for your dog to play around with the family and get all the love that he/she deserves! Especially after having dealing with those horrible, itchy pests! When choosing the best flea spray for dogs, there are a variety of factors that you need to consider. From the nature and sensitivity of your dog’s skin, as well as their age and weight, to the environment of which you live and the extent of the flea infestation; all of these elements will contribute to your decision for what product is best for you and your dog. Sprays are good because they are applied directly to the skin and the area where the fleas are, they last just as long as other topical treatments, and they kill as well as getting rid of fleas and ticks at all life stages. It is important to consult your local veterinarian as to what products are suitable for your breed and size of the dog, as well as their recommendation of product based on the extent of the infestation. 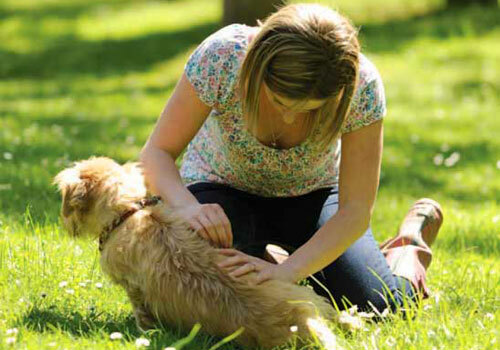 While spray on treatments are mostly safe for dogs at all life stages and of a variety of health qualities, some breeds can be more sensitive than others, so always monitor your dog and their reaction within the first 24 hours of application. Different spray on treatments use different active ingredients, but all of them will perform the same task; to kill the evil pests taking over your dog and fleas in house too. It is recommended, no matter how earlier you caught the problem, that you choose a flea spray that kills adult fleas, their eggs, and larvae. This will ensure the entire infestation is treated and will begin to prevent the problem from reoccurring. Other than that, if you find a brand that you like and that works, stick with it! Before using flea spray on your dog, there are some suggested things you can do to give yourself the best chance at fighting the infestation. 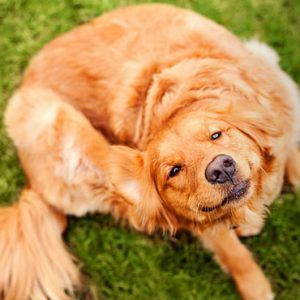 Fleas don’t grasp onto your dog’s hair, so giving him a really good bath using your flea shampoo for dogs or a medicated flea rinse, will loosen the fleas from your dog’s fur and wash them down the drain. Bathe your dog 24-48 hours before applying the treatment. There are specifically designed flea combs that you can purchase at your local pet store. The thin bristles will drag out any dead fleas or eggs. You may also consider having your dog’s hair shaved to a shorter length so that the chemicals in the flea spray can reach your dog’s skin easier, and kill the pests. The day that you treat your pet, it is recommended that you also treat your home. This means cleaning your floors, particular rugs, and carpets that your dog would have laid and rolled on. By placing a dog flea collar inside of your vacuum cleaner, the pests will be killed as soon as they are sucked up. Washing your pet’s flea and tick collar, bed, and blankets is also recommended. While the washing cycle will loosen and drain away some of the flea eggs, drying the items on a normal cycle for over 30 minutes will kill the remaining pests. If the fleas can’t find an animal to latch onto and feed off, they will latch onto you. A domestic mosquito spray around your feet and ankles is a good idea when you are just commencing flea & tick treatment. There are hundreds of flea spray available in the market… so which one should I choose for my dog, you ask? Well, I have few recommendations of dog flea and tick spray for you, which I personally tested on my dog. Mind you, when I use a product on my dog, I do not compromise with the quality. Here, read my dog flea spray reviews for products that I highly recommend. 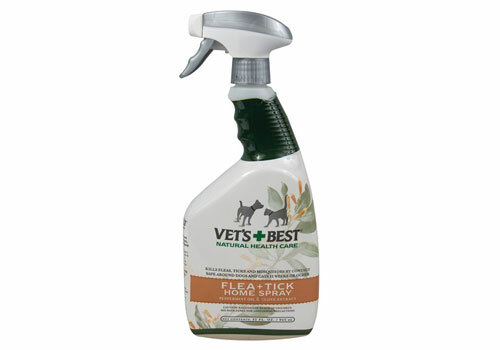 Vet’s Best Flea and Tick Home Spray is a natural product for the treatment of infestations on your pet and fleas in house. The key ingredients in Vet’s Best are peppermint oil and clove extract, and it guarantees that there is absolutely no pyrethrins, permethrins or cedar oil used to manufacture the spray. The natural composition of Vet’s Best means that it is great for dog’s who have a history of skin sensitivity and also an ideal product for use around young children. Vet’s Best can be used on dogs can cats 12 weeks or older. A versatile, easy-to-use product, Vet’s Best can also be used on all of your home surfaces, including furniture, carpet, flooring and countertops to make sure that the infestation is completely destroyed. This product will not stain surfaces that it is applied to. Customer reviews of Vet’s Best determine that the product does really work, and people are impressed by the smell and like that it can be used on home surfaces to also treat the surrounding area, without staining! 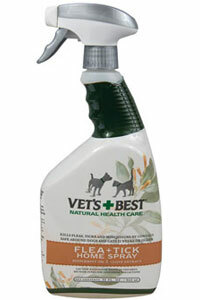 Click here to buy Vet’s Best Flea & Tick Home Spray on Amazon. 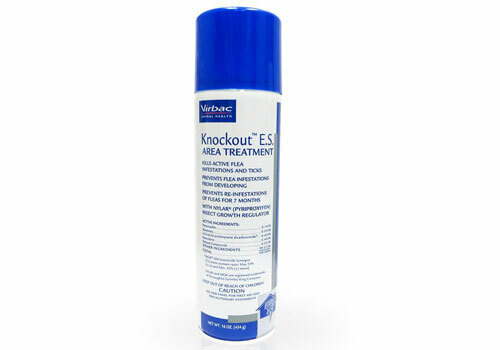 Virbac Knockout E.S. Area Treatment Carpet Spray is a product which you can use in addition to treating you animal with other flea and tick spray. As fleas can sit dormant on various home surfaces, waiting to jump onto you or your dog when you pass, it is recommended to treat not only your dog but also your home. A spray such as Virbac Knockout can help you treat the entire infestation and prevent the pests from coming back for up to seven months. Virbac claims that one 16 ounces can cover 2,100 square feet of flooring. A high percentage of customers experienced successful results when using Virbac Knockout on their floors. It is recommended that caution be taken when spraying, and to make sure that all food be put away into cupboards before spraying. 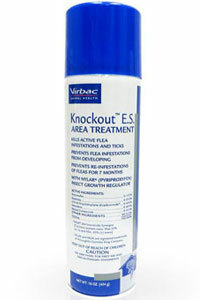 Click here to buy Virbac Knockout Flea Spray on Amazon. It is recommended that your wear latex gloves when applying flea spray to your dog. Once you have your dog comfortable and settled, start with the head and work your way down the body. 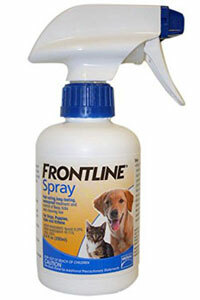 Using one hand to block your dog’s eyes and mouth, direct a firm spray on your dog’s head and neck. 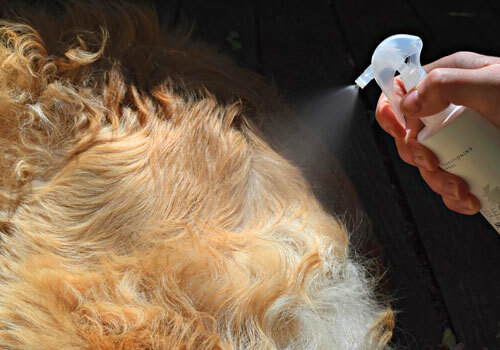 Once you’ve applied the spray, massaged the medication into your dog’s hair and skin. Make sure that the area around your pet’s ears and neck is thoroughly treated. 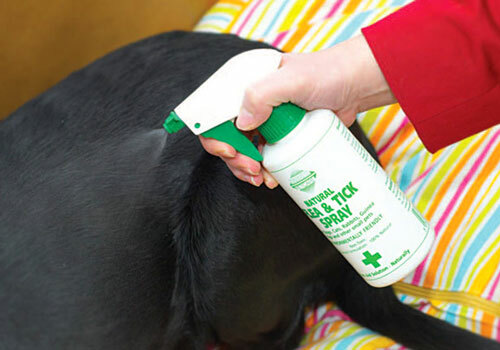 When spraying the rest of your dog’s body, work your way back towards their rear, spraying against the direction of their fur. 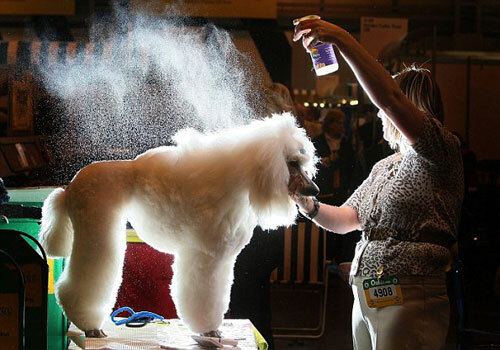 If you dog’s hair is quite long, it can also be beneficial to lift up the layers of fur and spray directly underneath. This will ensure that the chemical is absorbed into the skin. Finish at your dog’s rear but don’t forget about their legs and tummy. Treat these areas by simply spraying your glove and massaging the chemical onto your dog’s legs and tummy. Although using a flea spray is considered a safe way of treated your dog’s flea problem, it is important to remember that you are dealing with chemicals and need to use certain precautions. The most important thing is to ensure the safety and comfort of your pet. If you are worried about your dog’s sensitivity to the flea spray, apply the chemical on a small section of their skin first to see their reaction. 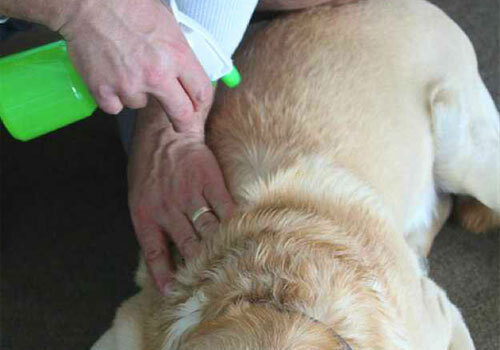 When applying the flea spray, take caution when spraying around your dog’s head. There are a few ways you can tackle this area. Some ways that I believe are the most effective are by spraying some of the treatment onto your hand and rubbing it over your dog’s head, neck and around their ears. Or you can use one hand to cover your dog’s eyes and do one firm, direct spray on the top of his/her head and down the back of the neck, proceeding to rub it in around their ears afterwards. The main thing is that you don’t get the flea spray in your dog’s eyes or their mouth. It is also recommended that your dog is kept contained and away from small children until the treatment has fully dried. Monitoring your dog to ensure that they don’t try to lick off the treatment is also important. You might want to also consider wearing latex gloves while applying the flea spray to product yourself from the chemical. If you are not afraid to get your hand dirty, here is a video to make flea spray at home. Although we have covered everything related to flea problem in dogs, but it wouldn’t hurt to summarize. It’s the quick question and answer section, where I respond to some of the most common questions that dog owners ask. So let’s get to it. 1. Are flea sprays the most effective way of flea prevention for dogs? 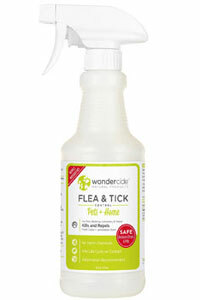 Flea sprays can be the quickest and one of the most effective way of treating and preventing fleas. As they are applied directly to the affected areas, the neurotoxins begin their work killing and destroying the evil pests straight away. If this particular style of flea treatment works for you, then it is highly recommended. 2. Do flea sprays work on both adult fleas and eggs? Most flea sprays do kill fleas at every lifecycle, being adult fleas, their eggs, and larvae. The active ingredients attack and poison the nervous systems of fully grown, adult fleas while other chemicals, commonly referred to as Insect Growth Regulators, prevent eggs and larvae from developing and reproducing. This inevitably prevents future flea infestations. 3. Can flea spray cause allergies? As the chemical is sprayed directly onto your dog’s skin, you may be concerned about skin irritation that your dog may experience. If you know your dog has sensitive skin, it is recommended to treat a small section on your dog’s rear to test for a reaction first. If no unordinary systems occur in the first 24 hours, it should be safe to treat the rest of your dog’s body. Just make sure to block their eyes and mouth when spraying around their head. 4. Can I use flea spray on puppies? One of the main benefits of flea sprays is that they are designed to be used on pets of all ages and sizes. So they also work well for fleas on puppies. However, depending on the manufacturer specifications and ingredients used in the flea spray, it is recommended that you consult your local vet or the product packaging to ensure that the product is appropriate for your dog’s age. 5. Can I bathe my pet after applying a flea spray? 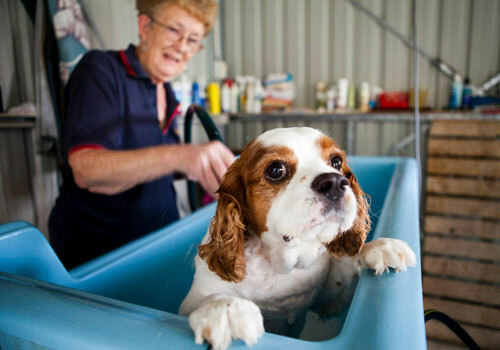 Some flea treatments are designed to not be affected by water; however it is recommended that you bathe your pet 24-48 hours before applying the treatment with one of the flea shampoo for dogs. Once the spray is fully dried and absorbed into your dog’s skin, you can once again bathe your dog, although this is not necessary. 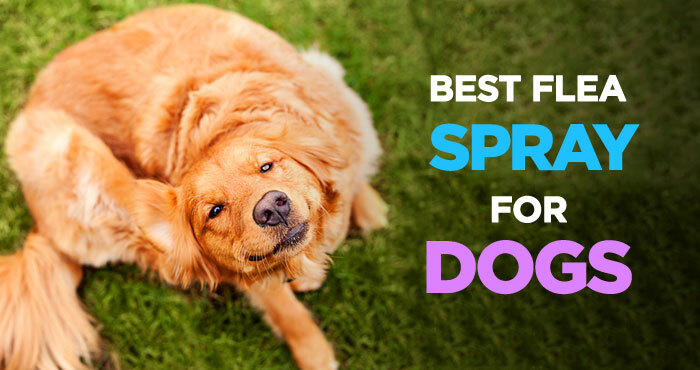 Searching for the best flea spray for dogs can be a tedious task but if you do your homework beforehand, and after a quick chat with your veterinarian, you can quite easily decide which product will suit your and your pet. Flea spray is one of the best way to get rid of fleas from your pet as well as fleas in house. Choosing flea spray over other flea and tick treatments is ideal for pet owners looking to treat their pet and their home. Safe for application on most home surfaces, flea sprays will kill the current infestation and, when used regularly, will prevent the problem reoccurring. Stop battling fleas and destroy them once and for all! Vet’s Best Flea & Tick Home Spray was reviewed by Brian Hersh on July 15, 2018. *Disclaimer: Our flea and tick for dogs reviews are based mostly on our expertise and the experts/veterinarians we consulted with and the information provided by the manufacturers. We do test many products, but it’s not possible to test them all. As such, please remember the above recommendations are our opinions, and before using any treatment, please consult with a local veterinarian.